Now that it's fairly common for families to have two wage earners, many husbands and wives are accumulating assets in separate employer-sponsored retirement accounts. In 2018, the maximum employee contribution to a 401(k) or 403(b) plan is $18,500 ($24,500 for those age 50 and older), and employers often match contributions up to a set percentage of salary. But even when most of a married couple's retirement assets reside in different accounts, it's still possible to craft a unified retirement strategy. To make it work, open communication and teamwork are especially important when it comes to saving and investing for retirement. Tax-deferred retirement accounts such as 401(k)s, 403(b)s, and IRAs can only be held in one person's name, although a spouse is typically listed as the beneficiary who would automatically inherit the account upon the original owner's death. Taxable investment accounts, on the other hand, may be held jointly. However, sharing plan information and coordinating investments might help some families build more wealth over time. For example, one spouse's workplace plan may offer a broader selection of investment options, or the offerings in one plan might be somewhat limited. With a joint strategy, both spouses agree on an appropriate asset allocation for their combined savings, and their contributions are invested in a way that takes advantage of each plan's strengths while avoiding any weaknesses. Asset allocation is a method to help manage investment risk; it does not guarantee a profit or protect against loss. It can be difficult for a stay-at-home parent who is taking time out of the workforce, or anyone who isn't an active participant in an employer-sponsored plan, to keep his or her retirement savings on track. Fortunately, a working spouse can contribute up to $5,500 to his or her own IRA and up to $5,500 more to a spouse's IRA (in 2018), as long as the couple's combined income exceeds both contributions and they file a joint tax return. An additional $1,000 catch-up contribution can be made for each spouse who is age 50 or older. All other IRA eligibility rules must be met. Contributing to the IRA of a nonworking spouse offers married couples a chance to double up on retirement savings and might also provide a larger tax deduction than contributing to a single IRA. For married couples filing jointly, the ability to deduct contributions to the IRA of an active participant in an employer-sponsored plan is phased out if their modified adjusted gross income (MAGI) is between $101,000 and $121,000 (in 2018). 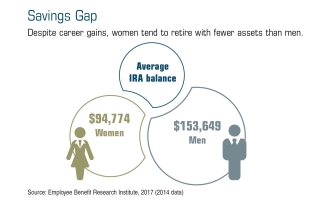 There are higher phaseout limits when the contribution is being made to the IRA of a nonparticipating spouse: MAGI between $189,000 and $199,000 (in 2018). Thus, some participants in workplace plans who earn too much to deduct an IRA contribution for themselves may be able to make a deductible IRA contribution to the account of a nonparticipating spouse. You can make IRA contributions for the 2018 tax year up until April 15, 2019. Withdrawals from tax-deferred retirement plans are taxed as ordinary income and may be subject to a 10% federal income tax penalty if withdrawn prior to age 59½, with certain exceptions as outlined by the IRS. I received a large refund on my tax return this year. Should I adjust my withholding?